Seeded | Learning how things grow. Two more tomato plants for the garden from the farmer’s market: Black Krim and Yellow Pear, the latter placed at the corner for the best access for small hands and short arms. They’re big beautiful plants, which my seedlings were not, but now that they’re all in the ground the difference is rapidly disappearing. I love it when nature makes up for my mistakes. Chloe and I went into the garden yesterday to eat a blueberry popsicle. Well, we went outside to eat the popsicle; we went to the garden to “tee if any tawberried are twipe” (she has yet to master Ss). The slugs have been industrious and I haven’t replaced my Sluggo yet, so she’s been disappointed in a couple of ripe berries and was willing to try anything that looked even a little bit red. It turns out that half-ripe garden strawberries are slightly tart but still full of tangy flavor. The pea trellis is crawling with life, so we tried a few peas, too. She loved these. She likes peas to begin with, and will eat frozen peas and corn for lunch (sometimes heated up, sometimes still frozen), but these were clearly a different experience. She delighted in receiving the two halves of the pod I split open for her–“like a butterfly” and picking out the peas, one by one. She gave me slightly less than half, which I thought was pretty generous. We’ve got a few corn stalks coming up, which she also wanted to eat until I told her they weren’t the same as the corn on the cob we’ve had a couple of nights in the past couple of weeks. (Can’t she tell the difference? When I point out the seedling that look like a fatter grass, and is quite clearly not a plump cob full of sweet kernels? 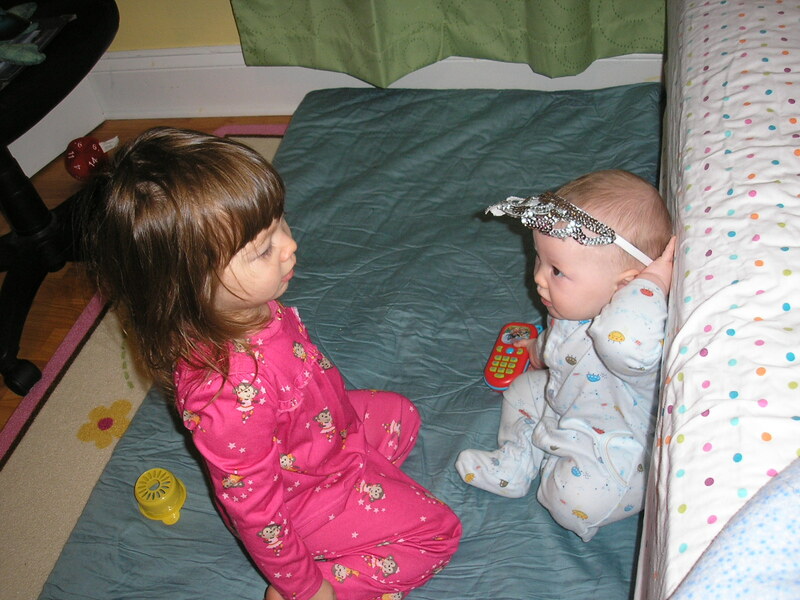 Toddlers are strange.) The squash and peppers and eggplant are doing okay, for now at least. I’ve got a bunch of what looks like cucumber volunteers coming up among the tomatoes. I don’t know what they’re from. Compost, I guess. What cucumbers did I grow two years ago? Do I want to keep them? I have a hard time pulling them out, when you buy them for $2 each at the local nursery, but they can’t stay and crowd my tomatoes, either. I moved one to a better spot and we’ll see how it grows. I’ve also got some volunteer dill among the weeds that are slated for later slaughter, and some Hopi Red Dye amaranth. I love that that’s still popping up here and there. Also some tomato volunteers in the side garden, but they’re getting pulled out when I get a chance because as I recall they were awful in previous years. And the beans and greens and carrots and roots are growing well–as are the weeds, but let’s ignore that for now–and I’m pleased with what I’ve wrought so far, even if I fear for the summer. And staying out late in the garden picking half-ripe strawberries and half-grown peas for my girl was just what I felt that garden is for. Tomatoes are in. It’s a little early, but the forecast looks good and they’ve grown as much as they’re going to in the little seed-starting tray (and I’ve faced the fact I’m not going to pot them up). They’re small, but I have hopes. Chloë helped me plant them. We did transplant the garlic and plant a bunch of roots and greens; I thought I’d written about that but evidently not. And we’ve been going out for some extremely minor weeding, though sickness and a tricycle have prevented us from doing much lately besides. She has a great time digging around with the little spade she got for Easter, and continually asks me to dig for worms. When I find one, she accepts it in her hand with delight and coos at it for about three seconds. Then she puts it carefully down in the hole and asks me to find another one. I’m glad she treats them well but it doesn’t leave me a lot of time to do my actual digging. But we put up posts and I dug nine holes for the nine tomatoes I’d originally started, forgetting that two didn’t come up (my trades, darn it). I put some compost in each hole and planted the tomatoes carefully, burying them deep to encourage root growth. “I want to bury a pot,” Chloë announced, so I gave her one of the ones that didn’t come up and helped her make a little hole for it. The tomatoes I planted, winding around starting from the top right: Amish Paste, Arkansas Traveller, Brown Berry, Italian Market Wonder, Jelly Bean, Persimmon, Tiger-Like. (Why yes, that’s alphabetical order. I didn’t write it down, except here just now, so I had to have some way of remembering for later in the season. My flags are already faded.) I’ll buy two more at the farmer’s market next week to fill up the empty holes. Also some sweet peppers; the only ones of mine that came up are hots. I’m sure they will be immensely helpful in the garden. Someday. In the meantime: hello, gardening world, I’m back! Infrequently, probably, though my current plan involves scheduling gardening time at least twice a week so I can be sure to (a) get things planted and picked at least, and if possible tended as well, and (b) get the girls (and me) outside, especially Chloë. We’ll see how that goes. So Chloë and I have planted a few early seeds, mainly the ones I’m not sure are actually going to germinate–onions; leek; cotton; old kale, komatsuna, and choy sum; and some flowers. Some were “winter sown” (though I’m not sure that term actually applies with the mildness of the winter and the lateness of the date) and some started in Jiffy pots and put in the window. 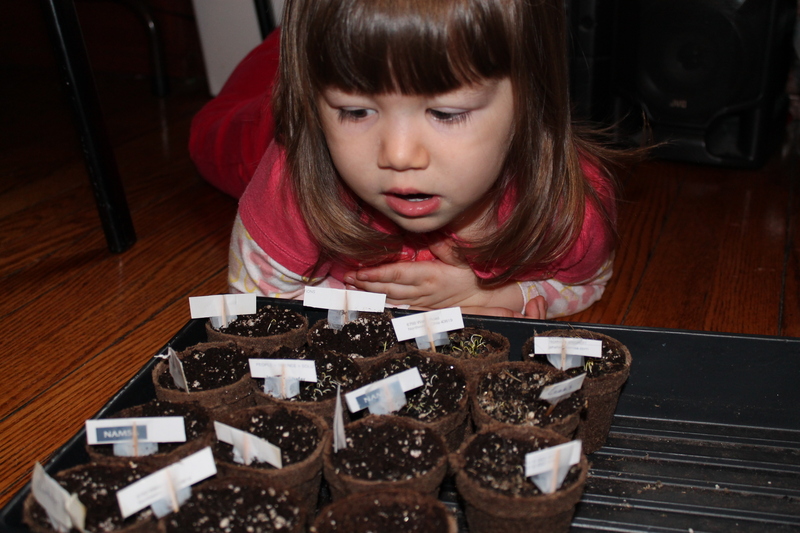 Chloë was intrigued by the process, particularly the “sprinkle seeds on the dirt” and “mix the dirt and seeds around with your fingers” bits, and when I came home today with more seeds immediately wanted to plant again. I sure hope some of the ones in the window sprout. Today’s seeds are from the Toledo Botanical Garden (actually Toledo GROWS, I think) Seed Swap, which was a hell of a thing. In previous years it was at the actual Toledo Botanical Garden and was fairly crowded, but this year it was at the Erie Street Market and it was a mob scene. They took a large room, and had a whole section just for kids to pet bunnies and look at chickens; there were the usual tables for corn, roots, greens, cucurbits, flowers, etc., plus some displays on native flowers and rain gardens and such; and there was also a corner for garden-related stuff for classrooms (I loved the straw-and-Saran-Wrap greenhouse and the five-plastic-bottle-and-rope seed starter with central water reservoir); a table of seed bombs; dozens of displays; tables from commercial farms, nurseries, and other less relevant businesses from the area; a silent auction; and probably more that I didn’t catch because I thought I was just going to pick up a few seeds among a few gardeners, not fight my way among half the city. The place was packed. I got there about forty-five minutes in (because I’d had to get the kids to naps first, and then get a bag of apples from the farmer’s market and a new 9×13 pan from the Libbey Outlet) and the tables were two and three people deep, except for the legumes table where they’d run out of green beans. This was something I’d come for, but by the time I was getting ready to go later donations had shown up and I got some Chinese beans, which should be interesting, and some cowpeas. And I think I’ve got some Kentucky Wonders on the windowsill and I’ve still got Trionfo Violettos from a number of different recent years, so I think I’m fine. And I got some cucumbers and more carrots and a lettuce, which was all I’d really come for, plus some other interesting-looking stuff because why not? and I needed the crush of people to be worth it. I did recommend Russian Red kale to someone, and help someone else by pointing out the purple kohlrabi, and maybe the seeds I donated ended up with people who’ll use and enjoy them. Last year was a washout on gardening, by the by. I planted five tomato plants in pots, plus some green beans and some basil. The basil did fine, and we got a small number of grape tomatoes. But tomatoes in pots are clearly not a good idea without more care than I put into them–though cleanup was great. I did get the gardens covered in plastic to kill the weeds–and by “I got” I mean “Dad did it while he was here for Maia’s birth”–but only got one uncovered last fall, so there’s plenty of prep work to do once it decides to stop snowing/slushing/being ridiculously windy. In summary: hello again! I’m going to be gardening this year. Some. With the dubious help of a toddler at times. (I’m considering growing a Mammoth sunflower “fort” for her.) Watch this space. But not with any assiduity or you’ll probably be disappointed. But believe that I’m glad to be back. Er, you weren’t expecting anything from me, were you? The garden has been, um, there. We’ve gotten some tomatoes, most of which went immediately into Chloe’s mouth. I picked two the other day. She pointed and whined, so I handed her one. She ate it like an apple, stem and all. She pointed to the other one. I destemmed that one and handed it over, and she ate it as well. She loves it when dinner includes a fine heirloom tomato, chopped up just for her. She doesn’t especially like the ones you get on sandwiches and burgers in restaurants, so clearly she inherited some good taste. But yeah. Some tomatoes, some peppers–I finally grew Alma paprikas this year–some herbs, a couple of scallions, a few green beans before the teepee fell over. Three carrots and a solitary beet. A lot of raspberries and parsnips. There are probably still potatoes down there somewhere. But mostly, the garden is a wreck. This gardening-with-a-small-child idea is just not practicable, not for me. And next year is going to be even worse, because I’m doing it all over again next spring. So I’m closing down the garden. I’ve been slowly making last harvests and pulling down stakes, and I’m going to move the few herbs and flowers I really want to keep (the cannas I planted way back when have just started coming up; doesn’t that figure?). Then I’m going to pull everything down, cover it with compost and black plastic, and let it sleep for a year. It makes me sad to do, but looking at the weed-encrusted rotting shadow of what a garden should be makes me sad, too, and I’m just plain not going to have the time or energy–if I didn’t with one baby, I certainly won’t with two, and first-trimester symptoms are even worse this time than last. So next year will be a year without a garden, even if we sell the house, which we’re still trying to do. I’ll grow a few things in pots; I think I can manage that much, and Chloe’s appetite demands at least one or two tomato plants. But otherwise I’m closing down shop. Which means I’m closing down the blog, too. I may come back to it, if I feel like writing and feel I have something to write about, but I’m also working on other projects, and my energy is wearing thin these days, so for now, I’m putting it into hibernation with the garden. Good gardening, everyone! Plant a seed for me. Big Boy. Better Boy. Early Girl. Beefsteak. If you grow tomatoes at all, you probably recognize these as some of the most commonly available tomato plants available from nurseries every spring. They grow well; they’re easy to care for; and everyone grows them. This is partly because they’re what people know and grew up with, and partly because that’s all that’s available at nurseries. With the recent upswing in interest in gardening in general and heirloom tomatoes in particular, that’s changing somewhat; you might see a dozen, or maybe even two dozen, varieties available at any given nursery. But there are literally hundreds of tomato varieties out there. Have you ever tried a Cosmonaut Volkov? A Persimmon? A Zapotec Pleated? If you haven’t planted them yourself, chances are you haven’t. And chances are you won’t find those varieties in a nursery, even if you find the better-known heirlooms (Brandywine, Purple Cherokee, and Mortgage Lifter, for example). The only way to even try to experience the wonderful range of tomato variety is to start them from seed. Tomatoes are easy to grow from seed. A sunny windowsill, a bag of potting soil, and a few Jiffy or Dixie cups are all you need. Other vegetables are equally easy to grow from seed, and their marvelous varieties equally passed over. Take green beans, for example. Every gardener has seen Kentucky Wonders and Blue Lakes, and they’re great producers and great-tasting. But what about Trionfo Violettos, which are equally tasty, deep purple, and wildly productive (as well as much easier to see among the bean foliage)? Everyone has seen purple eggplant, but what about eggplant that’s white as a ghost, or apple green, or purple-and-pink striped? Gardeners often buy plants from nurseries because they’re easy, hardy, and convenient. Growing your own takes more planning and a little more work. But it yields more interesting plants with different flavors and textures for less money, and it’s been part of gardening over the world and since cultivation began: saving seeds from the best plants, and growing new plants from them. Pick up a packet of seeds this spring: a tomato you’ve never heard of, an herb variety that intrigues you, a melon you can’t get at the grocery store or the farmer’s market. Plant them, and see what new worlds of taste and color open up before you. Grow diversity. Grow the world. Grow from seed. I chopped up Persimmon and Amish Paste tomatoes yesterday for ratatouille-of-sorts (no zucchini, but yes pearl couscous) and fed bits to Chloe. She ate them like candy, or like she would eat candy if she were allowed to. She got her onesie all stained with pink and orange. I didn’t like the onesie anyway, so I wasn’t bothered. I don’t think I would have been anyway. So the tomatoes are producing, yes. Mostly the Amish Pastes and a smallish not-quite-cherry that I don’t know the name of. I don’t remember what I planted where, and I’ve given up trying. I have a couple of Alma Paprika peppers, one yellow and one pink, and some other unidentified peppers that I thought were jalapenos but aren’t, which was disappointing when I wanted to make salsa last night. (However, my mother-in-law can probably be convinced to part with some.) There are no beans yet, but lots of bean flowers. Likewise with the zucchini. (I planted them both late.) There is plentiful basil and sage, and beautiful raspberries and peaches. That’s about it, but I’m okay with it. At least I’m getting something. The days are hot and wet and full of mosquitoes, and the garden is, of course, full of weeds (though I did a quick emergency job on part of it when we had a house showing, and I’m trying to make time this week to go out with either boiling water or Round-Up to get more), and it’s the part of summer I really don’t like. Except for the eating part. My weed escapade has kept the side garden relatively nice-looking, though the poor lemon sorrel is baking now that it’s not shaded from the heat by all the other overgrown plants and weeds. I was afraid of that. I need to get some mulch. The reporter who wrote the Blade piece on my garden offered me some, but I totally forgot to go and fetch it, and since she’s now invited me over three times and I haven’t gone, I kind of feel like I’ve flubbed my chance. We’re now on our third summer of a tight budget because of Eric being out of work, so I’m not overly eager to buy mulch, but I never am, and the poor garden needs it. I am contemplating what to plant in the bare patches. More zucchini? Carrots, for the fall? Lettuce? It ought to be something. Of course, it should be something very low-maintenance. On the plus side, the peaches on the tree are just about ripe. On the minus side, I didn’t remove nearly enough of them, so they’re all apricot-sized instead of peach-sized. Now I know how many is too many for a tree that size to support. How big a peach would a tree with just one peach on it grow? Unfortunately I don’t think anyone who owns a peach tree and likes peaches would be willing to find out.